Approximately 20 miles. Or 1, if you’re us. But who’s counting? That’s right, today we cheated. We resigned. We chose to play on our vacation, rather than walk. 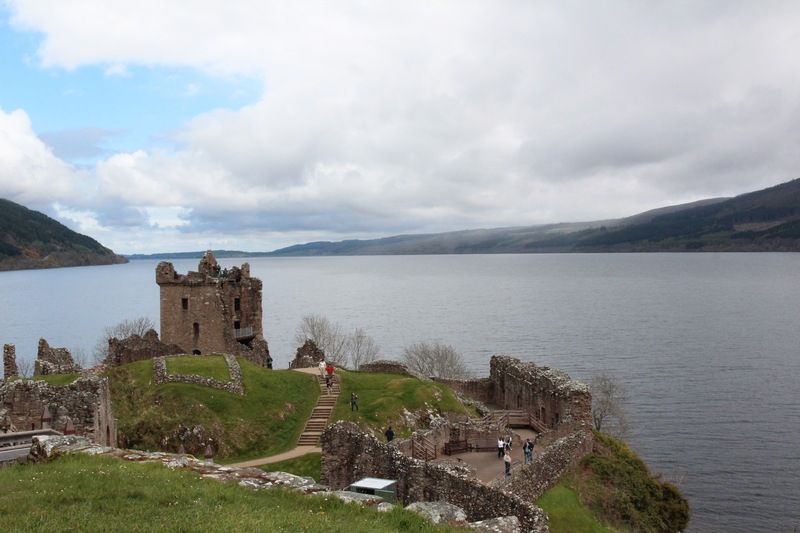 We learned about Nessie, explored a castle, and cruised the loch. We didn’t walk the trail at all, except the bits that took us from Tramps to castle. I will say that the decision to abandon our walk so close to the end made me a bit sad, but at the same time I would have regretted not spending time in Drumnadrochit even more. We started our day with a great breakfast and a hopefully adequate tip to the man who’d been manhandling our overweight bags between B&Bs each day (without charging us extra to do so). 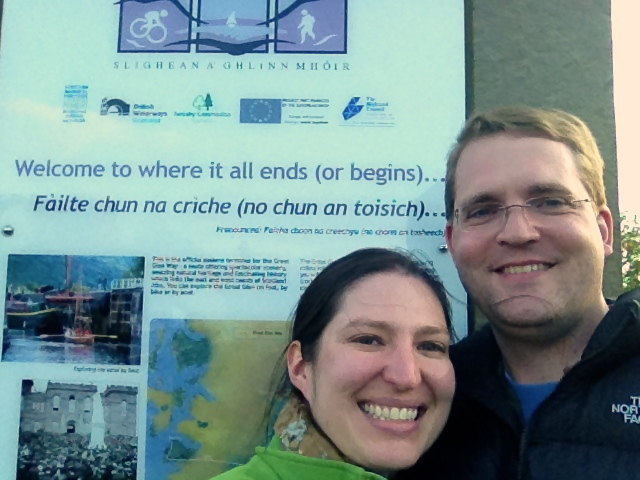 Then we went to go see what there was to be seen in Drumnadrochit. 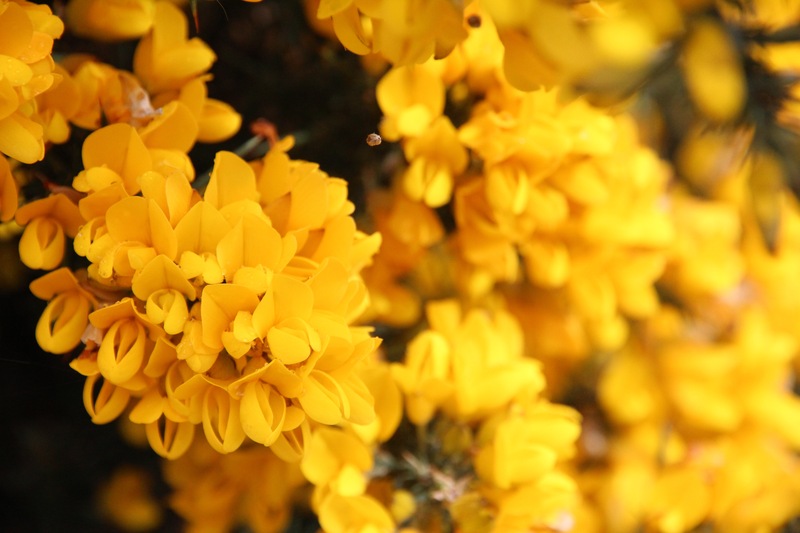 Pretty yellow flowers that we saw everywhere. Well, we didn’t go to NessieLand. But I still like the sign! Because there are two Loch Ness Monster “exhibits” in town, we had our pick. 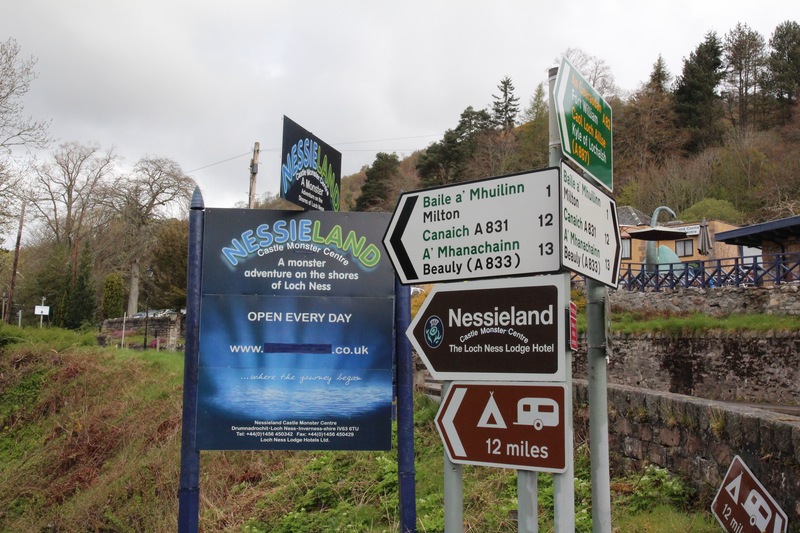 Simply because it was slightly more conveniently located, we chose the The Loch Ness Centre & Exhibition for our Nessie research. I can imagine this automated walk through monster history is packed in summer months, but we were there early in the day and early in the season, so had the tour to ourselves. We progressed through a series of “caves”, watching videos and peering at models and other mock-ups. I thought the whole thing was very well done, and a good job of explaining the history and science of Nessie, covering the improbability of a real monster, and yet still allowing for the hint of a possibility by explaining the field of cryptozoology. It was all very well done, and the gift shop at the end was one of the more satisfying shops we’d seen. Both Eugene and I picked up souvenirs (a stuffed Nessie! ), and I also found a few gifts and postcards for people back home. Our next stop was Urquhart Castle, situated a couple of miles out of town and certainly more populated than the Nessie experience. Unfortunately, there was spotty rain all day, so most of my pictures of the castle are a bit soggy. Urquhart Castle, from the road. 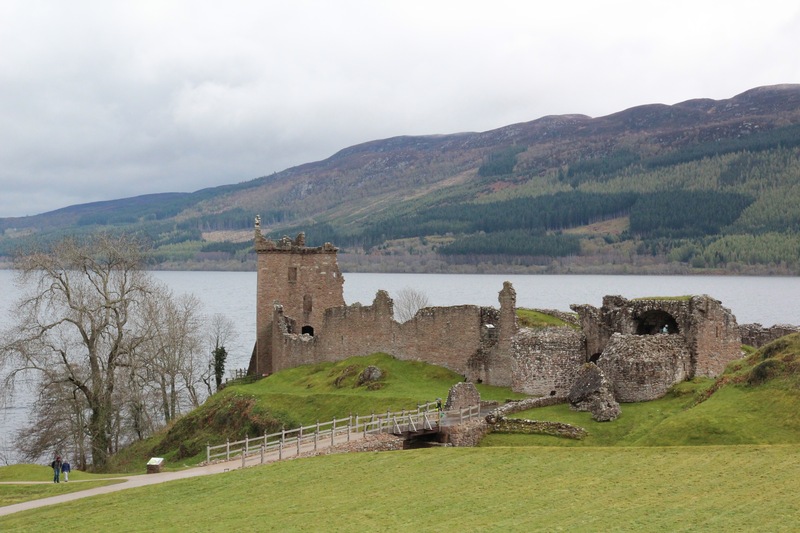 Urquhart Castle map and information. After we’d thoroughly explored the castle, the castle gift shop, and the gift shop cafe, we purchased a one-way boat trip from the castle dock to Inverness. (Our hostess at Tramps had kindly suggested this method of travel, and called and reserved our berth.) Unlike the rib boat ride during our stay in Fort Augustus, this boat trip was covered, and a nice radar screen gave anyone interested a chance to Nessie hunt. Eugene and I preferred to watch the loch pass by and look for signs of the Great Glen Way trail that we were decidedly not walking. I bought a coffee and some chocolate, and felt fairly self-satisfied and pleased with this end to our long walk. When we reached Inverness, a short bus ride and another short hike took us to our B&B for the night. On the way there, we passed the signpost for the end of the trail.